As I mentioned yesterday, the Boston MQG has decided to do something for our community given the recent events surrounding the Boston Marathon bombing. 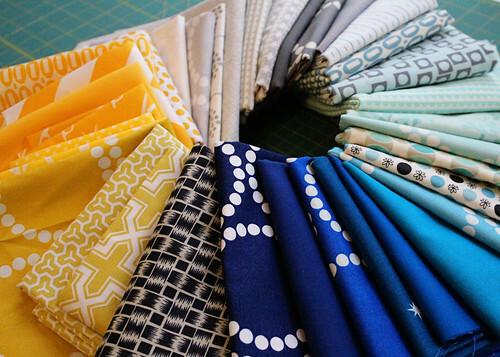 The modern quilting community really stepped it up leading up to QuiltCon, and we are reaching out to the quilting community once again to help those affected by these tragic events. We are asking folks to make quilt blocks in blue, yellow, gray and white - the colors of the Boston Marathon and The One Fund. Your blocks, like those made for QuiltCon, should be at least 12.5" wide by however long you decide. Below is a sample color pallet pulled by the talented Natalie of Greenleaf Goods. For the full details, please check out the Boston MQG blog post. Please mail your blocks to the Boston MQG by May 24th. In addition, we are also looking for coordinating fabric for the sashing, backing and binding. To help inspire you, here are some pictures of the many wonderful quilts created at QuiltCon using 12.5" quilt blocks. That colorway is really beautiful. Thanks for the info -- wonderful cause.